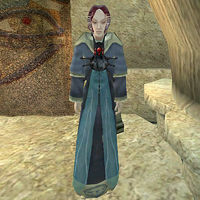 Flacassia Fauseius is an Imperial who serves as guild guide for the Guild of Mages in Vivec, which is located in the Foreign Quarter plaza. For a fee, she will offer you instant transport to any of the other guild halls. Guild membership is not required, though it will earn you a considerable discount. She is wearing an extravagant robe and shoes and is carrying 40 drakes. Aside from her natural charm and ability to absorb fatigue from others, she knows no spells. Mossanon: "Yes. I remember a High Elf named Mossanon. Went back and forth from Sadrith Mora quite a lot a while back. Sometimes traveled with a Telvanni woman. But I haven't seen him recently." Trebonius: "Did he give you any duties? Oh, that's not so bad, I guess. He asked me to make an inventory of all the plates and bottles in Vvardenfell. I'm never going to get in done in time." This page was last modified on 25 August 2016, at 19:32.